Last April I blogged UK stupid press tricks? Three separate "dogs rescue their masters from choking" stories in the past four months about articles in the Daily Mirror, the Carmarthen Journal, and the Daily Star. According to today's Daily Mirror and Daily Mail -- see the video above and the following screen shots -- the four-legged lifesaving spree continues! To my knowledge, the first recorded "dog rescues choking master" case was in 2007, when Debbie Parkhurst of Calvert, Maryland, claimed her pooch "Toby leapt up and down on her chest, dislodging the chunk of apple that had lodged in her throat." The story was widely reported and even landed her and Toby an appearance on the Letterman show. I have no reason to doubt the veracity of any of these stories. Plus they provide me with fun, bloggable material. On the other hand, it's not so difficult to fake a choking rescue to gin up media attention. For example, my father and country music star Luke Bryant apparently did. Which leads me to this April Fool's Day challenge to merry pranksters out there. Make up a story that your pet saved you from choking and get it reported by a mainstream news outlet. So don't just stand there wagging your tail. Unleash your wits and see if any reporters roll over. 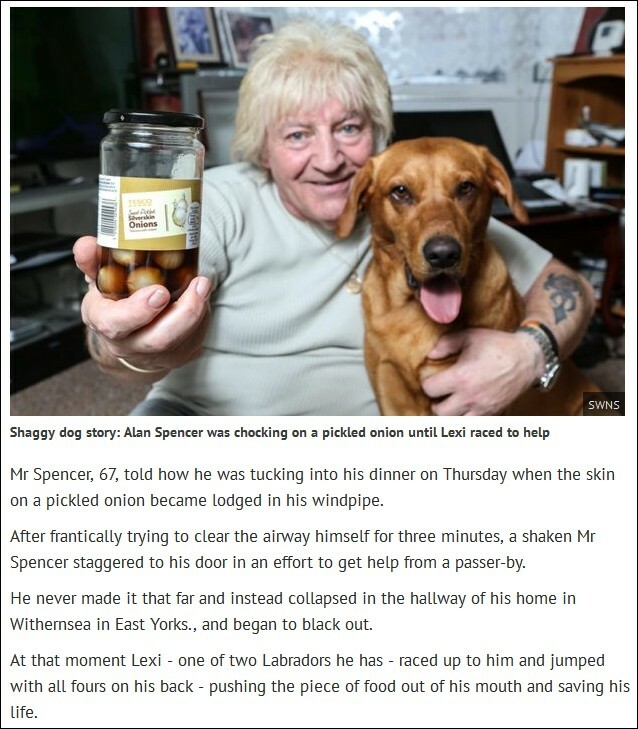 4/2/15 UPDATE: As two eagle-eyed Sidebar readers (both of whom are journalists) wrote me, contrary to the headlines and text of the Mirror and Mail stories, Lexi the lab did not "Heimlich" his master. The "Heimlich manoeuvre" (UK spelling) is an abdominal thrust -- a squeeze below the rib cage. 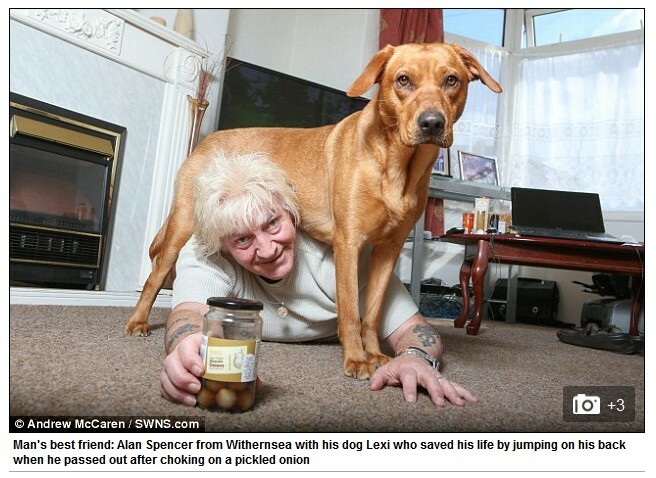 Mr. Spencer's precocious pooch reportedly jumped on his back. As it happens, Lexi's actions were in compliance with the first aid guidelines of St John Ambulance UK which, like the American Red Cross, recommends back blows as the first treatment response to a choking emergency. One of the sharp-eyed readers also suggested that Lexi be presented with a lifesaving award, so I'm sending a nomination to St John Ambulance UK and will report the results.